Choosing the right motorcycle helmet can be as difficult as purchasing a good motorcycle. Half-helmets are the least safe type of helmet a rider can buy. However, this design continues to be popular especially among cruiser owners. Having a nice breeze blowing around your face sounds extremely appealing during those hot summer days. Everyone knows that full-face helmets are the safest but somehow they simply don't look right when riding a cruiser and fail to provide the desired riding experience. The way you look on your motorcycle is very important and bikers tend to consider their motorcycle, clothes and helmet a personal statement. 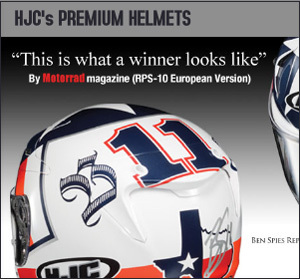 When picked correctly, half helmets can offer a combination of comfort, safety and style. Choosing a half-helmet will only provide you with a minimal amount of coverage allowed by law. However, it's definitely better to select a half-helmet motorcycle helmet than go with no helmet at all. If cruiser motorcycles are your thing and you like the half helmet design, you may want to know that many companies produce this type of helmets at a decent quality and reasonable prices. Helmets should provide protection so always make sure that the helmet you purchase has a D.O.T sticker on the back.